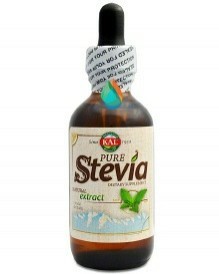 KAL Pure Stevia Liquid Extract 2 fl. oz. The KAL brand of Stevia has recently added maltodextrin to both their liquid and powder forms of stevia. Because of that, we can no longer recommended KAL for use on zero-sugar diet plans. We recommend the NOW foods liquid stevia to those who want to use a brand other than Sweetleaf (the most popular brand of Stevia). In a small bowl, whisk together garlic, ginger, mustard, and lemon. In another bowl, combine remaining ingredients. Slowly add it to the garlic mixture. Season to taste. Makes 1 cup and lasts about a week in the refrigerator. A quick pan sauce livens up simple halibut for a delightful and fresh-tasting entrÃ©e thatâ€™s perfect with a green salad on the side. 1. Heat a nonstick skillet over medium-high heat. Season the halibut with salt and pepper and lightly brown in the skillet, about 1 minute per side, carefully turning once. Add a splash of water, reduce the heat to low, loosen the fish if sticking, cover and cook for 2 minutes. 2. In a small bowl whisk together the remaining ingredients. Remove the lid of the skillet and pour the mixture over the fish. Stir carefully to coat, continue cooking 1 minute, and transfer to a warm dish. Serve immediately.? Unbelievable but true â€“ this delicious peppered steak gets a finish of flavorful sauce thanks to Stevia and a touch of creativity. 1. Heat a nonstick skillet over high heat. Press the pepper into both sides of the steak and season with salt. 2. Sear and brown the steak on both sides, then reduce the heat to medium-low, cover, and cook to desired doneness (about 4 minutes per side for medium rare). Transfer the steak to a serving dish and set aside. 3. Combine the milk, water, and Capella and Stevia drops in a small bowl and pour into the still hot skillet, scraping up any cooked bits with a wooden spoon. Pour sauce over the steak and serve immediately.